The headline in Broadcast magazine reads: BBC puts the Proms out to tender. We don’t have a subscription and can’t offer you any more, but it does not look good. 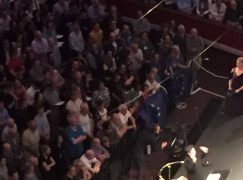 If the BBC sees fit to farm out the filming of the Proms, how long before it devolves the whole season into external hands? And would that necessarily be such a bad idea? BBC’s technical coverage of the Proms has been superb. Is there a huge saving to be made by contracting this out — at the same professional level? Or is this a prelude to letting it slide down the hill, in this new dawn you’re preparing for over there? And wouldn’t that be a shame. There’s nothing like Proms for scope and excitement. And a nice piece of soft power, isn’t that so? Oh for the good old days of John Drummond. The excitement of queuing for a Mahler 7, or a Maxwell Davies premiere. And now? What a mess. Yes, it is entirely the fault of the current BBC management that there are no more Maxwell Davies premieres. Robert Ponsonby’s days were my first and best. We could queue, stand, interact with the players, afford to be there, not have educational debts and so on… Times change but they don’t have to destroy traditions that actually benefit people. Little England bigotry did exist back then but it was not considered polite let alone supportable. The Proms are the BBC. When the BBC lets itself be rented out we get travestories like the final series of Torchwood. Travestories? Isn’t that the area across the river in Rome? Yes, just by the Punic Hills I believe. Buxtehude and Simon Anthony are right – if this happens it will be the beginning of the end. A travesty indeed. Buxtehude and Simon Anthony are right – a slippery slope if this happens. A travesty indeed. It’s what Murdoch’s press and the braying Tory-boys have always wanted: the outsourcing, privatisation and eradication of the BBC.